NOTICE: Requires the base game Borderlands 2 in order to play. Activation key must be used on a valid Steam account, requires internet connection. ABOUT THE GAMEThe Ultimate Vault Hunter Upgrade Pack 2: Digistruct Peak Challenge adds 11 more levels of character growth, new legendary gear, and the challenging “Raid on Digistruct Peak” map offering even more high-level play. 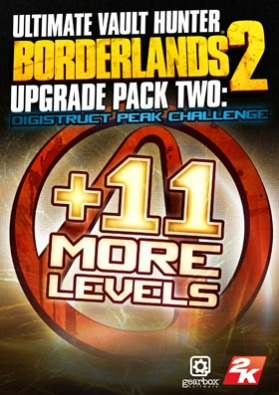 For players who want… to get the most out of their Borderlands 2 experience, the first Ultimate Upgrade Pack and Ultimate Upgrade Pack 2 can be combined for a max level cap of 72 , even more legendary gear, and new over-leveled modes!SYSTEM REQUIREMENTS Minimum: OS: Windows XP SP3 Processor: 2.4 GHz Dual Core Processor Memory: 1 GB XP, 2 GB Vista Video Memory: 256 MB Video Card: nVidia GeForce 8500 / ATI Radeon HD 2600 Sound Card: DirectX 9.0c CompatibleRecommended: OS: Windows XP SP3/Vista/Win 7/8 Processor: 2.3 GHz Quad Core Processor Memory: 2 GB Video Memory: 512 MB Video Card: nVidia GeForce GTX 560 / ATI Radeon HD 5850 Sound Card: DirectX 9.0c CompatibleOTHER REQUIREMENTS & SUPPORTSInitial installation requires one-time internet connection for Steam authentication; software installations required (included with the game) include Steam Client, DirectX 9, Microsoft .NET 4 Framework, Visual C++ Redistributable 2005, Visual C++ Redistributable 2008, Visual C++ Redistributable 2010, and AMD CPU Drivers (XP Only/AMD Only) © 2009 - 2013 Gearbox Software, LLC. Published and distributed by 2K. Gearbox Software, Borderlands, and the Gearbox and Borderlands logos are trademarks of Gearbox Software, LLC. 2K and the 2K logo are trademarks of 2K in the US and/or other countries. Unreal, the circle-U logo and the Powered by Unreal Technology logo are trademarks or registered trademarks of Epic Games, Inc. in the United States and elsewhere. NVIDIA and the NVIDIA logo and The Way It’s Meant To Be Played are trademarks and/or registered trademarks of NVIDIA Corporation. This software product includes Autodesk® Scaleform® software. © 2013 Autodesk, Inc. Autodesk and Scaleform are registered trademarks or trademarks of Autodesk, Inc. and/or its subsidiaries and/or affiliates in the USA and/or other countries. Powered by Wwise (ce) 2006 – 2013 Audiokinetic Inc. All rights reserved.